Awakening in the night I saw the snow had started. I could see a single flake circling. My hopes for a White Christmas rose. The falling flakes were just beginning and not yet starting to stick. In the morning would there be frost on the windows, the backyard full of white brush strokes, snow making a hand-made, home grown Christmas-card border. I went to sleep hoping to see a snowy carpet, an antique oriental design in the middle of Mother Nature's loom. The ornate glittering pattern was already connecting silky threads of memory, welcoming the best spirits of the season. You can imagine every flake drifting past the light. Up again, I had to peek to see if it'd started coming down more heavily. Already a big clump came down on the roof. The flakes were so big and wet that they weren't drifting, they were yelling "bombs aweigh." Watching here with my kitty, both of us were close to the window, keeping an eye on thickening flakes. After a while kitty curled up, and I couldn't help watching more of the starting snow. The forecast for more promised a deep, white blanket in the morning. 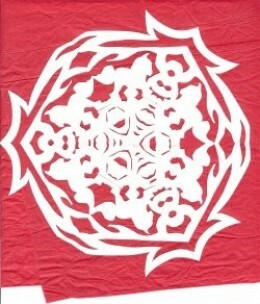 So back to bed I went thinking of shoveling paths and cutting out more home-made patterns. ©2011 puerdycat. All Rights Reserved. Mother nature was silent in the first snow. Last night she yelled. The wind was her voice, chasing all traces of a very-late Indian-summer. When I woke . . . it took a moment to realize the power was out. When the snow is deep it's always silent here. I knew where my tiny light would be; found by touch. My security when the lights go out is my tiny fish-flashlight within reach of my pillow. With just a glimmer at my window, it lit my way to candles and matches, the phone book and my phone. I called the power company. "If you had power, you'd be one of the few, the lucky ones," said the cheerful voice. There was a power station and lines down all over town. I spent most the day in candle-light before, in the afternoon, the lights came back on. The house kept us warm and cozy until everything started purring, and, ah, finally, coffee. The snow is so deep that the kitty tracks are belly-deep tracks, and I'm happy in a million ways. I love the Holidays, especially the spirit of the season. Amid the chatter of what people want to buy, I do hear generous New Year's wishes. My hopes are like those! I want people who are sick to have comfort and healing; children who have no parents, to be adopted and loved. I want people to never have to worry about whether they have food, clean water and medical care! I hope people will help when they see need. I hope none will be afraid to reach out for the help that they need. My very best wishes to all of you. ©2011 puerdycat. Rights reserved. Use for home crafts allowed. Fold a piece of paper in half. Then fold into 3 pieces. This would make a 6-piece pie. Trim so that all the parts are equal, but leave the out-side edge looking rather uneven. Trace the pattern and clip out the spaces. It might take some practice to get it right, so be patient while you are getting started. Wasn't that easy? Now you're ready to start drawing or tracing patterns of your own to clip! I've had some snowless Christmases, too. Sending snow wishes to you. What a sweet page about the beauty of a snowfall. I personally love to see the first snow, but this year it came as 2 feet the end of October. I did NOT like that! It is all gone, so now I wonder if our (New Hampshire) Christmas will be white. Enjoy your snowflakes! Find everything you need to make homemade Christmas candy. Get everything you need from molds to oil even candy thermometers.